Vectornator offers a rock-solid set of tools for professional designers and, at the same time, a radical simplicity for graphic arts amateurs — a fantastic all-around package for everyone. Thanks to the outstanding performance, intuitive usability and high user-friendliness, working with it is incredible. Specifically designed for iPad and iPhone everything is incredibly fast and creating outstanding high-quality illustrations with your fingers and a pencil is simply a dream. A touch application needs to be different than a mouse-operated program. The interface of Vectornator is perfect for touch. You can even use more advanced and more targeted operations like Shift and Alt on the desktop with multi-touch gestures. Still interested in a keyboard? Vectornator supports all the usual keyboard shortcuts and you will not miss anything. – Shift and Alt with multi-touch gestures and dedicated buttons. 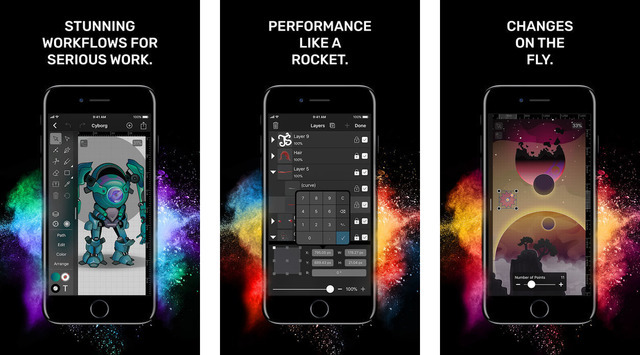 Vectornator Pro provides the complete bundled power of a desktop graphics application as a mobile app. It’s the easiest, fastest, and best way to create illustrations, from any place and in a phenomenal quality. – Takes full advantage of powerful iOS technologies such as Metal, Grand Central Dispatch and SIMD. – Completely optimized for 64-bit and multi-core processors for complete hardware utilization—a jet plane among sailboats. A prefabricated library of standard user interface elements for the most common platforms enables rapid creation of user interfaces. Three clicks and you have designed the most beautiful app. Everyone can thus be convinced hands on. Share your work of art with everyone in the world. With just one click, you can post your drawing on Facebook or Twitter—and your followers will love it! You can download Vectornator Pro from the App Store for free at the link below.